Archetypes are present throughout every culture. The term refers to an original pattern from which all other things are based; essentially, it is the master copy of its realm. This can refer to thoughts, ideas, designs, and symbolism, to name a few. Understanding basic archetypes is crucial to accurately comprehending the symbolic nature of any cultures, but is particularly relevant when concerning the complicated spiritual structure of the Celtic culture. We have so much to learn from the ancient wisdom and learning details of the foundation archetypes will help to bridge the gaps in our knowledge. The benefits that come with ancient Celtic knowledge use the original patters created by nature. Humanity is one with nature, something that we often forget in modern times. Recognizing our true roots activates a certain appreciation and sense of connection to our roots within each of us. The Celts realized their deep connection with nature, which made it easier for them to channel any attribute of nature that they desired, as it was already present within them. For them (and for us) these attributes and characteristics are personal archetypes. Each and every archetype can be represented by with a variety of symbols, giving us options for whichever suits our individual needs, desires, and personalities most. We can each identify more closely with certain ones, but we know that all are present (no matter how minimally) within us. By utilizing symbols through focus and meditation, the traits found in nature manifest within us. As such, the ancient archetypes act as catalysts of personal, spiritual transformation. We owe the ancient Celts a great deal, for they provided us with a wonderfully systematic, yet creative and individualistic way of interpreting and acting upon our vision for our lives. They created the groundwork for our symbolic interpretation by developing the complex archetypal network. By using the foundation that they and other groups have lain out for us, we are able to more easily expand our own knowledge and develop deeper meaning in our own lives. 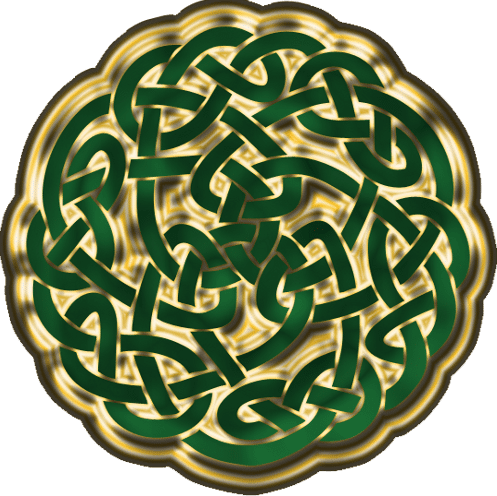 Virtually all ideas, beliefs, and symbols described in Celtic tradition have an archetype. This applies to deities, tattoos, war symbols, and knots. As far as gods and goddesses go, there are two that can be considered archetypal for the Celts, one male and one female. Danu is the mother goddess, symbolic of lunar qualities and the matriarch of all Celtic deities. She is leader of the royal family of gods, Tuatha de Dananna. Her qualities range, but, as an archetype, she does come with general attributes and traits that make her divinity special. Danu is the ultimate love and giver, encouraging others to be generous and loving, too. In Celtic lore, it was her compassion that nurtured a broken and defeated people back to strength in order to reclaim their stolen lands. With unmatched fighting skills, she recognized the true potential in mortals with her keen sense of judgement. Although generous with her gifts, Danu only gave to those who were truly worthy. Additionally, the mastery of artistry by the Celts is perhaps inspired by her, as she was believed to be extremely skilled in craftsmanship, music, poetry, and art. The Celts saw the beauty, magic, and compassion that Danu represented and used her as the embodiment for further deities. The male archetype was called Cernunnos, the horned god. He is an extremely masculine and solar figure, representative of virility, fertility, sexuality, and the animal kingdom. Cernunnos could grant great agricultural bounty and abundance during the hunt. His masculinity conveyed strength, power, wisdom, and dominance. However, his bull-like horns were also depicted in a crescent moon shape, which allowed for interpretations of some feminine-like energies. Mostly, this served to represent the necessary balance between the male and female gods/goddesses and their attributes. Cernunnos was the sun, the light, and strength, while Danu was the subtle light in the dark, the mother, and the mysterious. Celts also used archetypes in their various forms of artistry, such as with jewelry, objects, and tattoos. These varying forms of art were majorly important for representing the Celts’ core beliefs, ideas, and history, so no single line or curve went unplanned. Each stroke was deliberate and stood for something of value to them spiritually. Often times, this was portrayed with Celtic knots, animals, geometric shapes, and numbers. The most centrally used and revered shapes were the square, circle, triangle, and Celtic cross, while the numbers three and four were pivotal to Celtic existence. Basic symbology includes a circle representing eternity and connectedness among all of nature, while the triangle stood for a perfect balance. While the number three symbolized a number of trinities, four was indicative of the natural physical elements: earth, fire, water, and air. To this day, we can still find the ancient Celtic archetypes throughout their stories, symbols, art, and craftwork. By recognizing the original ancient beliefs and meanings, we can more accurately use the true energy of the many Celtic symbols.